Frederic E. Glantzberg was born on December 10, 1903 at Springfield, Mass. He received his high school education at DeWitt Clinton High School in New York. While an engineering student at the Massachusetts Institute of Technology, he was cadet captain in the ROTC. Upon graduation in 1927 with a Bachelor of Science degree in Mechanical Engineering, he was awarded a reserve commission in the U.S. Army Air Corps. 2nd Lieutenant Glantzberg reported to Brooks Field, Texas for flying training. He graduated as a pilot and as an observer from Kelly Field advanced school on June 25, 1928. Temporarily shelving his military status, he took a job with the Ford Motor Company, flying the company’s huge transports from Detroit to Chicago and Detroit to Buffalo on the Model Airway. On February 21, 1929 he was commissioned as second lieutenant in the regular army and joined the 9th Observation Group at Mitchell Field, Long Island, N.Y., and then in November of 1929, he was transferred to the Air Materiel Command at Wright Field, Ohio. There he was assigned as research engineer, Equipment Branch. While at Wright, he married, on April 5, 1930, Miss Claire Jackson whom he had met during his flight training at San Antonio, Texas. The Philippines was the his next assignment. In December of 1931 he reported to Nichols Field where he served briefly with the 2nd Observation Squadron; later as assistant engineering officer, Philippine Air Depot and, at the time of his reassignment to Langley Field, Virginia, in late 1934, he was engineering officer for the 28th Bomb Group. First Lieutenant Glantzberg arrived at Langley in February 1935 and assumed command of the 20th Bomb Squadron. In June 1938 he participated in the record breaking over water formation flight from Miami to Buenos Aires, Argentina in the then new B-17 Flying Fortresses --- along with generals Curtis LeMay and Robin Olds. After leaving Langley Field, Captain Glantzberg had three assignments specializing in Latin American affairs. In June 1939, he was assigned as technical adviser to the Colombian Air Force, stationed at Bogota, Colombia. He remained there until October 1941 when he was transferred to Albrook Field, Panama Canal Zone, as Deputy Chief of Staff for Operations, 6th Air Force. In March of 1942 Major Glantzberg was reassigned to Headquarters U.S. Army Air Corps, Washington, for duty with the Plans Division. He also wore a second hat as air member of the Joint Mexican-United States Defense Commission. A combat command loomed next. After a brief tour with the 467th Bomb Group at Orlando, Florida, then Colonel Glantzberg reported to Hammer Field, California. There he was checked out in the B-24 Liberator and assumed command of the 461st Bombardment Group on 25 October 1943. He later took the group to Italy where, as part of the Fifteenth Air Force, it served with distinction. While in command of the group, Colonel Glantzberg flew 50 combat missions and logged more than 300 hours of combat time. In October 1944, the general was recalled to Washington to serve as deputy director of the Scientific Advisory Board. Dr. Theodore Von Karmen was chairman of the board. Colonel Glantzberg was awarded the Legion of Merit by General H. H. Arnold for a long-range blueprint of the Air Force, which outlined and laid the foundation for the modern weapons and aircraft now coming into the Air Force inventory. In October 1945, Colonel Glantzberg was one of the first officers assigned to the Air University at Maxwell Field, Alabama. He participated in the organization of the Air Command and Staff School and later served as one of the instructors. He attended the Air War College before returning to Washington to again serve for eight months as deputy director of the Scientific Advisory Board with the additional duty of assisting in organizing the Human Resources Division in the Directorate of Research and Development. With school and staff assignments behind him, Brigadier General Glantzberg returned to his first love, command of and active participation in the flying activities of combat organizations. On 4 April 1949 he took command of the 2nd Bombardment Group and Wing at Chatham Field, Georgia, and converted it into Hunter Air Force Base, Georgia. 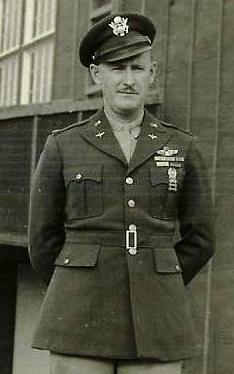 During 1952, Brigadier General Glantzberg commanded the Air Task Group at the Atomic Energy Proving Grounds, Eniwetok. On 6 January 1953, Major General Glantzberg assumed command of the 4th Air Division at Barksdale, Lousiana, which was then converting from B-29s to B-47s. From 1954 to 1956 he commanded the U.S. Air Force in Europe's Seventeenth Air Force with headquarters in Rabat, Morocco. In the summer of 1956, Major General Glantzberg and his family returned to Washington where he spent eight months as chairman of the ad hoc committee on single manager for airlift services before becoming vice commander of the Military Air Transport Service in June 1957 and moving to Scott Air Force Base, IL. In September 1959, Major General Glantzberg retired from the United States Air Force and moved to Savannah, Georgia. General Glantzberg died June 26, 1970 in Kerrville, TX. He was buried on June 30, 1970 at Fort Sam Houston National Cemetery in San Antonio, Texas. Habits: An early riser - frequently plays a set of tennis before going to work. General Glantzberg is still an eager pilot of some of the most advanced types of aircraft, flies regularly all those available to the units in the field, including the century series. He has logged nearly 11,000 hours and is rated as a command pilot, and aircraft observer. Particularly fond of Mexican food, but likes all good food. Dresses conservatively, dark blues, grays and browns. Enjoys a good mystery story; usually watches TV on Sunday evenings. "You've got to be quick." "Let's not stand around on one foot." Demands forthrightness. He wants honest opinions. Is an energetic, dynamic leader. Is admired by the troops for his down-to-earth type approaches. While leading the Fifteenth Air Force on a bombing run to Ploesti, the #4 engine was hit by flak. It set the engine on fire and blew a hole in the top of the right Tokyo tank. #3 engine quit also. The plane started down out of control. Col. Glantzberg ordered bail out. Suddenly the sideslip pulled the fire out of the engine and gas tank. Col. Glantzberg got the plane under control at around 4,000 feet on #1 and #2 engines, and then asked for a crew count. With all the crew intact we started toward Turkey. #3 engine was re-started. Everything was thrown over board to decrease the weight of the plane and we finally arrived back at our home base 2 1/2 hours after the rest of the Group. In 1932, a swinging antenna (22 pounds) from another aircraft flying overhead struck Lt. Glantzberg. His skull fractured, the army pilot slumped against the cowling, unconscious. The co-pilot in the seat behind, also struck senseless by the same deadly missile, relinquished his grip on the controls. The plane plummeted earthward. At 500 feet, the pilot in the rear seat came to and bailed out. Lt. Glantzberg, also regaining consciousness in the nick of time, pulled the ship out of its dive and landed safely, then lapsed into unconsciousness again, blood streaming from a hole in the right side of his head. Army doctors had to remove four square inches of shattered skull in treating the wound. Refusing to have a plate put in to cover the hole, he had a hole in his head for the rest of his life.